Editor’s Introduction: Nanashi Sakagami is the newest writer here at W2Mnet.com. He’s looking to spruce up the place with a bit of musical art. Every so often, Nanashi writes song reviews and other types articles about the music scene. Here is his very first for the website. If you’d like to read more from Nanashi, you can check out his other writings on his blog. Last week, I was excited to see Ed Sheeran‘s name back in the Top 10 of the Billboard Pop charts. To my surprise, not only was he not even in the Hot 100, but “Treat You Better” (Shawn Mendes’ blatant rip-off of his slightly better, yet still terrible other hit “Stitches”) is in the 23rd spot. “Juju on that Beat Tz Anthem” is #11 on the charts as well. I bashed my head against my desk for 15 minutes (I’m not joking) in hopes of escaping the realization that this is what humanity has become. Fortunately, my prayers have been answered and “Shape of You” is now sitting in it’s righteous pop chart throne. On a side note, “Bad and Boujee” by Migos ft. Lil Uzi Vert is the second biggest song in the country. By the way, as a song it’s still better than the other generic rap, but not by much. Why did I decide to review the newest release by one of last year’s biggest acts? 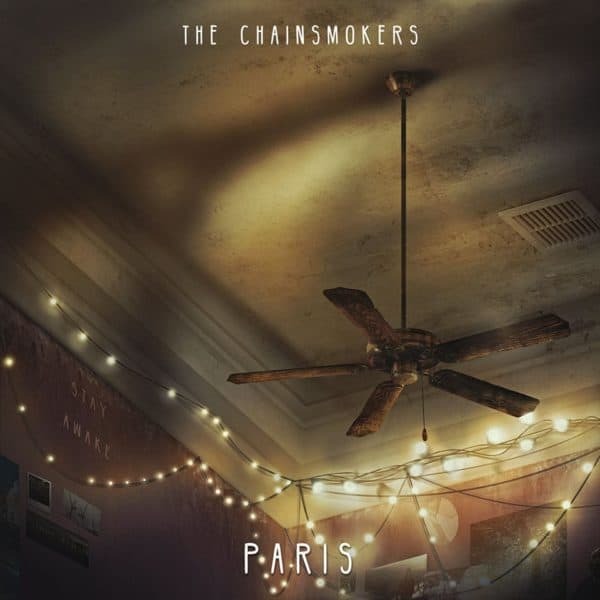 The Chainsmokers song “Paris”. First, the name. I asked some friends what song I should review next and no one knew who Migos was. However, they all liked The Chainsmokers. Secondly, after listening to both songs, “Paris” is slightly more interesting than “Bad and Boujee”. Just like with Shawn Mendes, slightly, meaning barely. I don’t know how many times you can say something is dull before it gets, well, dull. Music in 2016 was so bad. I feel my standards for new music have been significantly lower, in desperate attempts to grab whatever I can find. In American mainstream, the music scene was dull ambiance with a beat, which is boring, or songs that actually sounded like something and sucked. So pick your poison. “Paris” is a continuation of this thread, and probably because my bar has been set so low, I don’t mind it. For one, it has more energy than most songs in 2016. Just like “Closer” it also has more lyrical depth than most songs in 2016. However, musically there’s a lot of a clutter in this song. There’s too much going on and its not letting anything breathe. For example, I can’t hear what the piano is trying to play. I know it’s a slight variation of the 4 Chords of Pop structure (D-A-Bm-G), but when I figured out the bass-line the chord progression seems to be G-Bm-A-F#. When I play with the song, I can play G-D-A-Bm, G-D-Bm-A, G-Bm-A-F#m, G-Bm-A-F#/D, etc. Basically, any variation of the 4 Chords structure sounds good if you play it in the song. Showcasing exactly how much noise is in the song. I’ve tried to find one variant that sounds completely off, and couldn’t find it as long as it starts with G. What am I trying to say here? Not only is this song uninspired. It’s also cluttered. Almost as if, The Chainsmokers knew how uncreative this song is and tried to hide it with tons of tracks, sounds, riffs, and beats. Another problem that everyone has beaten to death is how they CAN’T sing. No exception here. Their voices sound sore, as if they physically can’t sing. However, I’ll give this a pass, because this has been a complaint in a lot of their songs. At this point, its not a matter of vocal talent anymore, that’s just their sound. To me, that’s like complaining about Bob Dylan‘s voice or Jimmy Hendrix‘s wah-wah and distortion. If you don’t like it, that’s fine. However, that’s their sound and changing it would result in a completely different artist. Despite The Chainsmokers’s inability to sing. I do like their vocal melodies in the song. Every time I listen to the song, the more these riffs and melodies grow on me. They are very catchy, but not exactly “Closer” catchy. “Closer” latches to your brain for days, like a merciless parasite. Even though, the verses being so forgettable. “Paris” is not that catchy, but as a whole, it is a better constructed song. The music may be uninteresting, but the lyrics did catch my eye. The song has a “desperate lovers” vibe. Although, I’m not sure if said lovers are going to run away to Paris, or if they are in times of emotional hardship, reminiscing of their best times represented by Paris. I was leaning towards a combination of the two options as hinted by lines like “if we go down, we go down together” and “show them we are better.” Even though, they sing “we were staying in Paris” it didn’t seem like it was literal. I researched to see if it was a reference to maybe Casablanca or Paris of Troy who fought bravely for his love, Helena. However, looking at the video, I did see a little dictionary entry at the beginning that read “paris \pa-rəs\ n 1: A sentimental yearning for a reality that isn’t genuine. 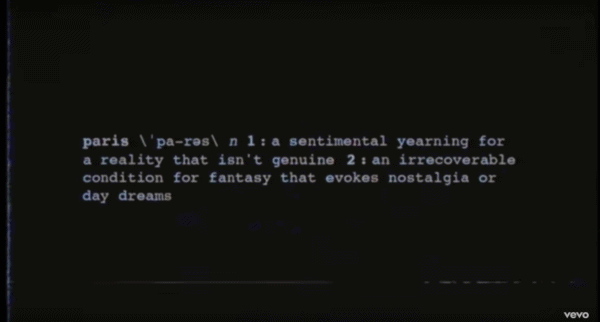 2: An irrecoverable condition for fantasy that evokes nostalgia or day dreams.” This definitely fits the tone of the song, but this definition felt too good to be true. I looked up the definition for Paris in several dictionaries and found nothing. This leads me to believe that The Chainsmokers made the entire thing up. In any other medium, this would’ve been catastrophic. In music, this is fine. Having this dictionary-like visual defining what “Paris” means is them literally explaining to you what the song is about. Paris in the song is a metaphor and not the actual city. This takes the line “we were staying in Paris” to a whole different meaning. It still feels like these lovers are in a time of emotional peril, and trying to prove themselves and everyone by reminiscing of better times. However, with this definition of Paris, it makes it sound more of a delusion. Is it his delusion? Or is it hers? Maybe it’s both of them who yearn for something that is not real. Thus, they are in denial, and try to find love where it is not. This is A LOT of emotional depth for The Chainsmokers of all people. I expect this level of songwriting from rock and metal bands writing epics, not the duo who thought “#Selfie” was a good song in ANY way. 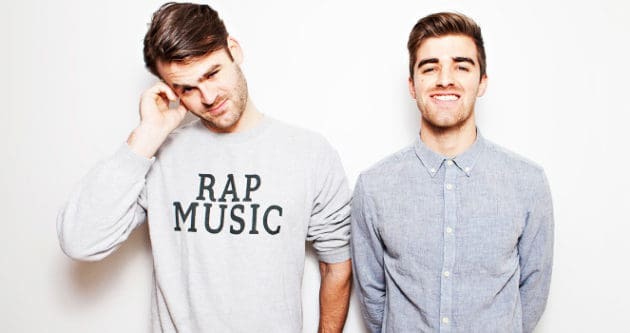 I decided to review The Chainsmokers at first, because of the brand name they now are. However, they caught me by surprise. Musically, they are terrible. (I’m not taking that back.) They have an ear for nice riffs but as composers that’s all they have. 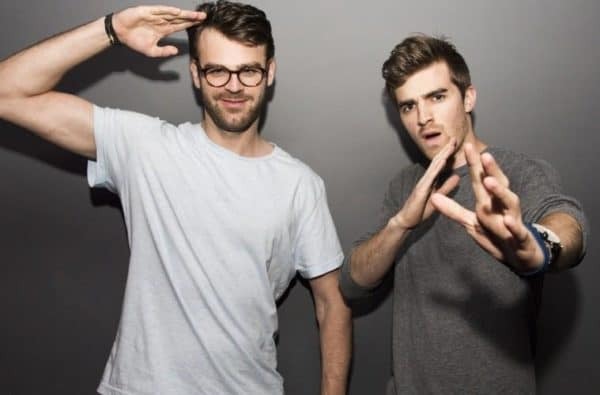 To me, The Chainsmokers are the musical equivalent to Eiffel 65‘s “I’m Blue (Ba Da Dee).” One good riff and no more. “Closer” is guilty of this deed, and “Paris” is too. Before anyone complains about how “You don’t get electronic music, because you don’t like it in the first place.”, I do like electronic music. Caravan Place and Alstroemeria Records are two great electronic artists I can think of right of the top of my head. 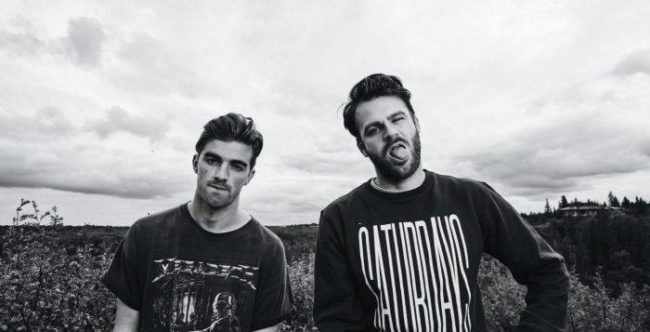 The Chainsmokers are just run of the mill mediocre pop sensations. However, I will admit, I did underestimate them as songwriters. I’m very pleasantly surprised to see the level of depth they can get with an admittedly cliche subject matter. My music standards might be at the bottom of the barrel right now, but “Paris” is undoubtedly a step in the right direction for Pop music.